I've just been watching the NASA press conference regarding their discovery that suggests water has been flowing on the surface of Mars recently! Images taken durng the Mars Global Surveyor Mission document many locations on the surface of Mars that show evidence of very recent liquid water activity in the region. 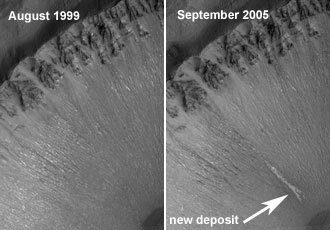 Scientists had long thought that liquid water last flowed on Mars millions of years ago. The implications of this discovery are enormous, with the possibility of life on Mars coming ever closer to reality. Wow! Read the story at NASA's website here. Wow now that is something Water=microbes wouldn,t you think. In that 7 year period between 99 and 06, not only was there evidence of liquid water, there was also evidence of meteoric strikes that may help determine the age of the surface of mars. If the crater surface isn't really ancient, perhaps the surface was more earth like with water and a different atmosphere. The implications are staggering. Well imagine there could have been quite alot of life on mars before it lost its magnetic field . But not totally shocking (IMHO). ~All that we ever learn continues to remind us that the Cosmos is "chock-full" of strange surprises. Yes! Now THAT would be quite the find! I personally believe that chances for life under the surface there has about as good a chance as any. I would just LOVE to see something going on with regards to Europa. It would be truly fascinating! dankk wrote: I personally believe that chances for life under the surface there has about as good a chance as any. I would just LOVE to see something going on with regards to Europa. Remember that -- on Earth -- all higher Animal life-forms depend on free oxygen molecules to provide them with the energy required to metabolize organic nutrients. It took billions of years for microscopic algae to physically change Earth's atmosphere through Photosynthesis (CO2 in; O2 out...). Without their "table-setting" opening act, you or I never would have evovled at all. While there seems to be plenty of Energy present on Europa (and in the Jovian System, itself), I wouldn't be able to bet on the probability of Photo-synthetically oxygenated water, though.